Khoa Le tucks with gusto into a steaming bowl of soup. Now 88, recently out of a too-long stay in the hospital, Khoa’s appetite is as strong as his mind is sharp. We’re seated with Khoa’s granddaughter, Sasha Truong, in a popular restaurant in Garden Grove. 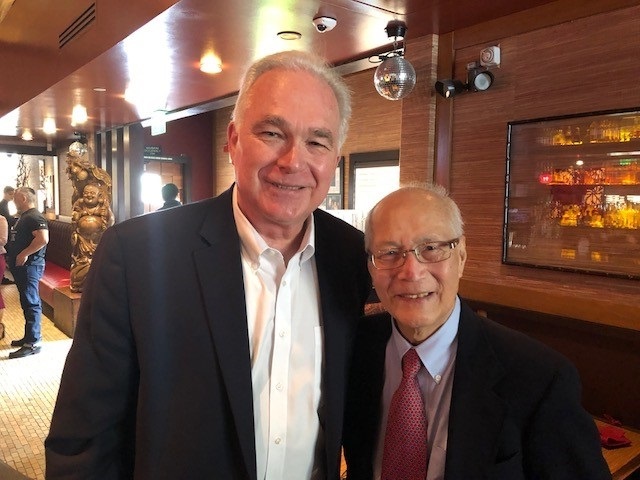 Khoa’s been recalling when he and I met in the mid 1980s during his busy days as president/CEO of the Southeast Asia Resource Action Center (SEARAC), a Washington-based national organization advocating for refugees and immigrants from Cambodia, Laos and Vietnam. Khoa is one of the most respected leaders to emerge from the then new and growing Vietnamese and Southeast Asian immigrant communities. I remind Khoa of how helpful he was to me as a program officer of the California Community Foundation working to understand just where our limited grantmaking funds might have the biggest impact on improving the quality of life for Southeast Asian immigrants, whose numbers at that time were swelling due to a second wave of immigration. I tended at that time to see my work in a pretty close-up view. I only now learn from this conversation the extensive reach that Khoa had not just in Orange County, but also nationally and internationally. He frequently testified before Congress and briefed White House officials on effective refugee admissions policy and community development programs. He attended international conferences and worked closely with the United Nations High Commissioner for Refugees (UNHCR) to find humane and durable solutions to critical refugee situations. And he helped build a non-governmental network of groups that continues today helping immigrants fashion new lives – political, social, economic, cultural – in America. Khoa would admit that a lot of conflicting views were in constant play during the initial years following both waves of immigration, the first coming in 1975 on the heels of the debacle of the Vietnam war. Even today, he acknowledges that his preferred take-it-slow diplomatic approach doesn’t necessarily satisfy those who believe in hastening change. I looked around me at the lunchtime clientele at Brodard Chateau, the restaurant where Khoa and I were meeting. I saw vitality and prosperity in the clientele, most of whom appeared to be of Vietnamese or Southeast Asian descent. If a restaurant ever reflected the surrounding community, Brodard Chateau that Friday afternoon certainly reflected Khoa’s. I looked across the table at my friend, my immigration mentor, whose great gifts are the lived example of patient persuasion and a belief that time sculpts an immigrant’s integration as much or more than the social programs and civil society that cushion a refugee’s arrival. And I looked across at Sasha, Khoa’s granddaughter, serenely listening, spicing her grandfather’s and my reminiscences with occasional thoughts hewn in the brilliant mind of a 26-year-old looking forward to a productive, contributing life while appreciating the present privilege of sharing a meal with the grandfather she clearly adores. Sasha’s Cornell education and Oxford University MBA will carry her a long way. I realized as I looked at the two of them sitting side by side – knowing Sasha was not even conceived when Khoa committed himself to his ‘peaceful evolution’ approach – that it was for Sasha and her generation’s success that Khoa devoted his life. He’s the first to admit that much work remains to be done, including putting the finishing touches on the memoir of his journey from Vietnam to America. But he has a successor with an ambitious gleam in her eye who sees a generation ahead and will define and lead yet another generation after that. Sasha has Khoa. Khoa has Sasha. Always and forever. Here in the most individual and human of terms is the experience and promise of immigrants that has shaped our country from the beginning, one now vividly at the center of political polarization and heated rhetoric. Here is both powerful history and promising future, together on the menu at Brodard Chateau.